Computer Science Assistant Professor John Dickerson (B.S. ’08, computer science; B.S. ’08, mathematics) was a contestant in 2003 and 2004 and now directs the contest. 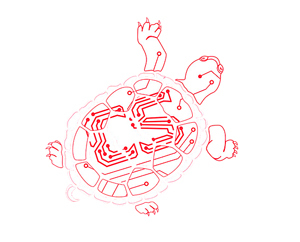 The University of Maryland’s Department of Computer Science will hold its annual High School Programming Contest on February 23, 2019. The contest draws some of the brightest young minds in computer science to College Park. This year, 132 students from 33 high schools in Maryland, Virginia, Pennsylvania and Washington, D.C., will have three hours to solve eight programming problems. The contest theme this year is “Incredibles 2.” Last year, with a “Jurassic Park” theme, one problem asked contestants to write a program to keep track of dinosaur eggs in an incubator. Although Dickerson will give out the questions this year, he was once on the receiving end: he participated in the contest in 2003 and 2004 as a student at Sherwood High School in Rockville, Maryland. Although his team did not win, Dickerson said that the contest was a great bonding experience with his teammates and opened his eyes to a different style of problem solving in computer science. The biggest lesson Dickerson learned as a contestant is that there is always a different or better solution to any programming problem. He also learned to watch out for unexpected situations that could cause his programs to work incorrectly. Students from the same school compete in teams of up to four members. Teams receive scores based on how many problems they solve correctly, how much time they took to solve the problems and how many wrong answers they submit. The six teams with the highest stores, as well as the first teams to solve any of the eight problems, receive prizes. In addition, the team that improves the most from the previous year receives the Gannon Prize, awarded in memory of John Gannon (1948–1999), a former professor and chair of UMD’s Department of Computer Science who was an enthusiastic supporter of the contest. The competition also helps the university build relationships with talented students from local high schools. Every year, Dickerson works with William Gasarch, a professor of computer science at UMD, to pair 30 to 40 students with UMD faculty mentors each year; Dickerson oftens discovers promising students at the contest. As a high schooler, Dickerson enjoyed working on the problems—banging his head against the wall, as he put it—until he came up with a correct solution. Now, as director, he enjoys watching the high schoolers go through the entire contest.